Drought conditions continue in most of the state (approaching 93% affected). And for the first time a significant area (approaching 18%) has reached Extreme Drought status. This is in the Northeastern part of the state with almost all of Essex County included. 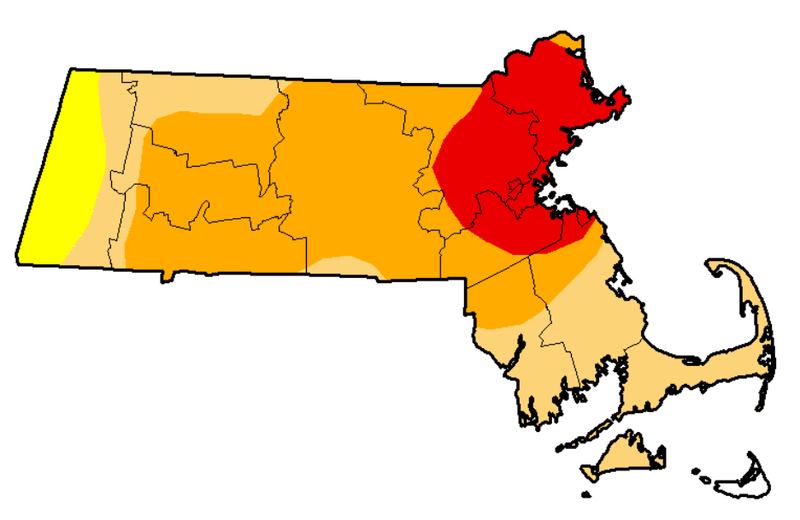 Only far Western Berkshire County is considered to not be in drought at this time. Under these conditions irrigation is essential for newly planted fields and for shallowly rooted plants like blueberries, and is recommended for all crops. Grapes can tolerate drought conditions fairly well if the vines are mature. However, splitting of fruit can occur if vines are under significant water deficit and rains come during the harvest period. To avoid this happening, irrigation to keep vines from being in a water defecit is recommended. Information about Drought Conditions and resources for Drought Response for fruit growers can be found at: https://ag.umass.edu/news/2016-drought-information-resources. Blueberries: Phomopsis twig blight, caused by the fungus Phomopsis vaccinii, is alive and well throughout blueberry plantings in CT. Infections take place in the spring, particularly when plants have been under stress or suffer from cold injury (think Valentines’s Day weekend and the cold April) with canes and twigs dying soon after. Symptoms will also appear well into the summer as leaves die and the canes go too. The fungus overwinters on the plant so an application of lime sulfur at 5 gal/acre in the fall after 2/3 of the leaves have dropped, or in the spring before bud break, will help to reduce the overwintering population. Be sure to follow this up next spring with fungicides at bud break, followed by another application 10 days later. 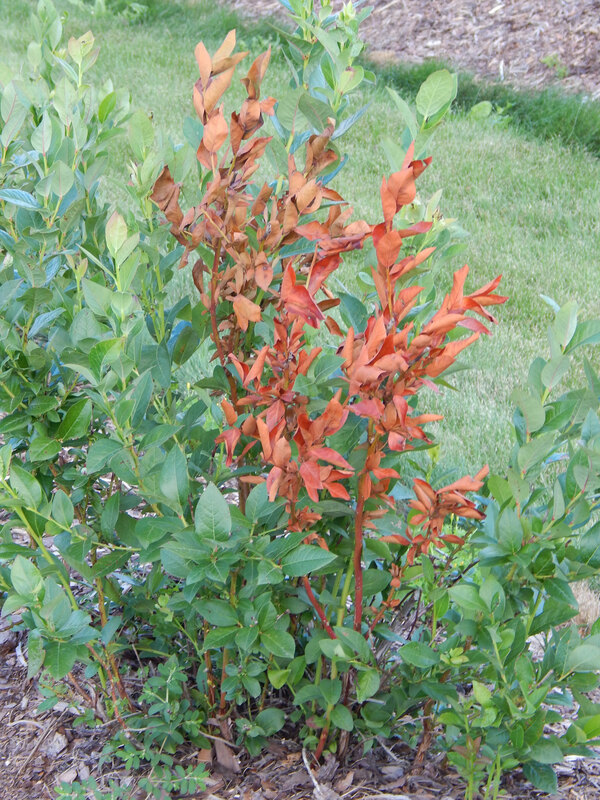 Left unchecked, this disease can cause extensive damage to your plantings in subsequent years. Strawberries should receive an application of nitrogen anytime from now through mid-September to give the plants the boost they need to get through the winter and the spring growing season. Nitrogen applied now will not push the plants to grow too late into the fall like it does with some fruit. Apply at the rate of 20-30 lbs per acre actual nitrogen. It is better to apply it when rain is forecast or if you have irrigation to water it in. Continued drought conditions are not conducive for moving the nitrogen down to the root system. If your foliar analysis and soil test indicate deficiencies of other nutrients, fall is a very good time to apply them so they have time to be taken up by the plants. Applications in the spring are good but the benefit is not going to be as apparent in the June crop as it will be with a fall application. Nitrogen is not recommended in the spring because of the potential for soft fruit. Grapes: With harvest rapidly approaching and most varieties at veraison, fungicide coverage is needed for rot diseases that infect at this time. Botrytis bunch rot, particularly a problem with tight clustered varieties, and Bitter rot, another disease that infects berries as they are ripening and is caused by the fungus Melanconium fuligineum. Warm wet weather is all that is needed for an infection to occur. That can occur with heavy dew on a warm morning as well as with a rain event. Sour rot is different from Botrytis and Bitter rot because the causal organism as actually more than one (some references indicate fungus plus bacteria, while others mention only bacteria) and has no known good chemical control. This disease prefers warm temperatures of 66-780F according to work done at Geneva, so it is a disease to be on the lookout for (your nose may be a very good indicator – sniff around for a vinegar smell) once the berries reach a brix of 15. Prevent damage to berries (birds, insects, excess water occurring during drought conditions, etc), control insects including the SWD, maintain an open canopy, and during a severe drought providing some water consistently throughout will help to reduce cracking if a tropical storm arrives with a deluge of water in a short time.